An Omura’s whale swam off the coast of Madagascar. The atmosphere on board the Julina was electric as researchers moved alongside an elusive Omura’s whale and her calf feeding and swimming near Nosy Be, a small island off the northwest coast of Madagascar. Until that moment, in 2013, nobody had captured confirmed video footage of the ocean creatures in the wild. It was a rare occasion, and one that would later put biologists on the vessel in the spotlight for their breakthrough research. Leading the team that day was Salvatore Cerchio, a whale specialist with the New England Aquarium, who is now also an investigator with the Woods Hole Oceanographic Institution on Cape Cod. Last month, Cerchio released detailed information on the team’s research on the Omura’s whales living in that area of the Indian Ocean. The study was published in the Royal Society Open Science journal. It marked the first time that both confirmed video images and detailed descriptions of the whales had been collected. 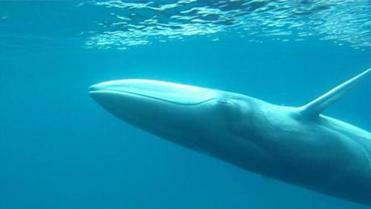 No one had ever before captured confirmed video of the mysterious Omura’s whale in its natural habitat. During a Skype interview from Madagascar, where Cerchio is gearing up for his third field study of the whales, the researcher described the exhilarating experience of encountering them in their natural habitat. What was your reaction when you first spotted the whales? Well, my first reaction was great excitement. We had thought they were Bryde’s whales. But, in fact, they were Omura’s whales. Bryde’s whales are a much more well-known species, but there is a debate about how many different forms there are. We knew there were supposed to be Bryde’s whales off of Madagascar . . . but we didn’t get good enough photos at that time [on a previous mission] to question what species it was, and it didn’t occur to us that it could have been Omura’s whales. People didn’t know much about Omura’s whales, and they weren’t supposed to be living where we were. In 2012 . . . I ran into a tourist, and he showed me pictures of the whales he saw off the bay, and he said, “I think they are Bryde’s whales.” So, I called one of the people from my team, and said, “You have to get over to this spot, because this guy has seen Bryde’s whales.” They went out there and photographed these animals that later we thought maybe were Omura’s whales. In 2013, we shifted our site . . . and we started seeing these same whales on a daily basis. We got good footage by hanging a camera over the boat. We kept questioning, “Are these really Bryde’s whales?” During the 2013 field season, I was quite certain we had found Omura’s whales, but it took another year until we had confirmation through genetic testing [done by Alec Lindsay at Northern Michigan University]. It was just very exciting when we got confirmation, because there was nothing known about the species and we were out there studying them really for the first time. The video is the first confirmed video of the animals. What is it that makes these particular whales so mysterious? What makes them mysterious is the fact that they are out there but they haven’t been recognized. They are similar in size and shape as the Bryde’s whales in that habitat, and they have always been confused with Bryde’s whales. But they are, in fact, a completely different species. The fact that no one had recognized that these animals were out there just makes them mysterious. Are they incredibly rare? It’s possible they are more rare than Bryde’s whales, but we just don’t know yet. One analogy I make is wolves and coyotes . . . If you didn’t know they were two different things, you might get them confused as the same thing. As you got closer to the whales, and you captured video, what did that feel like, knowing no one else had definitive footage of the whales in the wild? It was very exciting and a high-energy time on the boat. Most whale research time is actually spent looking at waves as you search for whales, punctuated by periods of great excitement and intense action when you are actually working with them. In both cases when we got videos, I was actually on the bow of the boat getting ready to sample the whale for genetics with a biopsy dart, and was directing my Malagasy team members to put the camera in the water when the whale came close to the boat. The first really good video was taken by Boris Andrianantenaina, when a mother-calf pair were nearby, and the mother had just fed and passed within a couple meters of the boat, in 2013. The second was by Tahina Rasoloarijao, in 2014 — he was actually quite new to it, and when a whale came very close to the boat, passing us from our stern to bow a few meters away, I told him to quickly put the camera over and he did it — first time ever handling the camera — and did an amazing job. We were all excited and cheering. It is a very animated and energetic activity. These whales are similar to Bryde’s whales. But they also have distinctive characteristics that set them apart from that species. What types of features specifically? There are two key characteristics that, if you get a good observation, are definitive. Omura’s whales have asymmetric coloration. They have a white lower right jaw, and a dark lower left jaw, and a white wash of pigmentation on the right side called a blaze. Bryde’s whales are symmetrical with both jaws dark. The Bryde’s whales also have three prominent ridges on the top of their head — actually on their rostrum. That is diagnostic to the Bryde’s species, whereas Omura’s have a single prominent ridge down the center. They also have different dorsal fins, with Bryde’s being more upright and square to the body. Omura’s have smaller, falcate — or curved — dorsal fins that slope into the body. You mention in your research that these whales make a “song-like” noise. What does it sound like? Well, you can’t actually hear it. It’s too low for our hearing. So, when I recorded it for the first time, I just put the hydrophone in the water when we were with these animals, and recorded for 10 to 25 minutes without hearing anything on my monitor headphones. But that night, when we were back at the field site, I looked at the recording and saw these very low-frequency vocalizations that I knew had never been documented before. I have some expertise in baleen whale acoustics, and I did not recognize these sounds, and pretty much immediately knew that we had just recorded a new vocalization for the first time. What was that like, knowing that? That was incredibly thrilling. Kind of an ‘Oh, my God,’ moment. Then each time we were with them I tried to record again, and started to see the stereotyped, repetitive vocalizations on several occasions. I have characterized it as “song” because it is stereotyped, repetitive, and rhythmic, and multiple animals sing at the same time in a chorus. I have spent a fair part of my career studying humpback whale songs and breeding behavior, so this is one of my specialties. So now that you definitely know, for the first time, that the whales are there, and you have started to identify a population, what’s next as you gear up for your third field season? This season I really hope to get more documentation on their feeding behavior, since we don’t know what they are feeding on, and it is unusual to have a baleen whale feeding in the tropics . . . . I think these guys are feeding on zooplankton like krill. [I also want to] collect another season’s worth of photo IDs in order to do “capture-recapture” statistics and attempt to estimate the population abundance and size. We will also do more recording to document their vocal behavior.